Breaking news: Blogging is dead. Before you panic, let me rephrase. 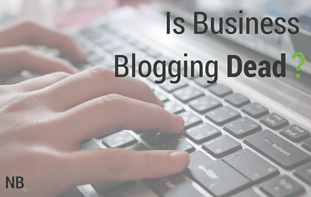 How you blog is dead. The ‘traditional’ business blog is no longer the most effective strategy for hitting all those marketing goals you set (increased traffic, qualified leads, conversions). Why? The traditional blog makes it difficult for you to segment your content based on buyer personas. As you (hopefully) know, any and all content you create needs to to be valuable for the reader. The way you do this is by knowing who your buyer personas are - your ideal customer(s) - and then creating a content strategy that speaks directly to their pain points. You’re probably asking yourself, “I do that already, so what’s the problem with my blog?” The problem with your blog is that all the posts you write for your persona numero uno are in the same place as the content for persona numero dos. And that's where the trouble lies. Your two personas have completely and totally different problems, concerns and questions, and yet your content is all mixed together in one place. How can they find what they are looking for? First off, your buyer personas are semi-fictional representations of your ideal customer based on market research and real data about your existing customers. But you already know that. We know we talk about them frequently, but with detailed buyer personas you can better determine where to focus your time, guide product development and allow for alignment across your organization. As a result, you’ll be able to attract the most valuable visitors, leads and customers to your business. Incorporating your buyer personas into your blogging strategy is the key for success. What’s the point of writing content for someone if you don’t really know who that person is? How are you ever going generate more qualified leads and customers in your sweet spot if you don’t speak directly to them? The first step is to recognize their pain points and write content that speaks directly to them with solutions and ideas. Unfortunately, having persona-driven content is just half of the game. Once upon a time, infinite scrolling blogs were it. They were the product everyone wanted to house and share all of their content. With an infinite scrolling blog, as a user scrolls through content, more content is loaded automatically. The advantage of such is that it offers an efficient way to browse massive amounts of information without having to wait for pages to load. While long scrolling blogs promise a better user experience, this frankly isn’t always the case, especially when you have multiple personas. There is little to no navigation, aside from those who include keyword categories and even then you may not find what you’re looking for. It can cause your site to feel unreachable. With never-ending scroll, you’re never able to reach the bottom of the page and, in turn, the footer which serves as a last resort when users can’t find what they’re looking for in the first place. Not only that, it doesn’t allow you to speak directly to your buyer personas or let them find exactly what they’re looking for - which we all know by now is an extreme disadvantage. It’s time for a new blogging architecture, one which is built specifically for multiple buyer personas and focuses on ease of usability while maximizing conversions. That’s why we created a PubHub; a publication hub which houses multiple blogs. By treating your blog more like a publication company, you’re able to anticipate why visitors are coming to your blog and what they want to do when they get there. Publishing companies like Inc, VentureBeat and Fast Company, understand that their readers come to consume their content for a number of different reasons. That being said, they structure the navigation of their sites to reflect such motives. B2B blog readers aren’t much different. A PubHub is the sweet spot between education and conversion, both of which are vitally important to your blog’s life. Here are 4 steps to take to make magic happen on your PubHub. It's evident that the old way of business blogging is out and there's a new way to educate your buyer personas and nurture them through the marketing and sales funnel. It's no longer just about creating content, but more about putting a strategy behind your content. Creating a publication hub as your blog allows you to tighten the alignment between your personas and your inbound marketing for a stronger, more focused marketing plan. Don't write-off blogging, the next generation is just ahead. What are you thoughts on the next generation blog? Comment below, we'd love to hear!